T-Mobile has been experimenting with handing out rental Android tablets to baseball fans at Angel Stadium in Anaheim, Calif., for $10 per game, according to a T-Mobile press release and the Los Angeles Times. That means for about the price of one measly beer, you can watch America's pastime unfold in real life ... or you can explore the interactive game program, watch live TV, read exclusive magazine content, and, of course, play Angry Birds. 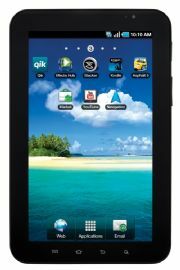 The 7-inch Samsung Galaxy Tab and the 8.9-inch T-Mobile G-Slate are the Android offerings at Angel Stadium. T-Mobile installed cellular antennas inside the ballpark so the Galaxy Tab can run on the network's 3G network and the G-Slate can function at 3G and 4G speeds. Part of T-Mobile's experiment makes sense, as many ballpark attendees -- and everyone that's hyperconnected, for that matter -- multitask between reality and whatever's happening on their smartphones. The video games are also an excellent distractor for antsy children unaccustomed to sitting still for three to four hours straight. But doesn't this strike anyone else as slightly ridiculous? The $10 rental fee is very reasonable, but some kind of deposit will be necessary so people don't walk off with a pricey device, meaning you'll have to be extra careful passing hotdogs and beers -- and consuming them yourself - or else you may get slammed with a hefty charge for a now-broken device. Besides the fact that people should realistically pay baseball prices for seats at baseball stadiums to watch baseball and not tinker with a tablet, neither the Galaxy Tab nor the G-Slate has an app advanced enough to catch foul balls flying into the park, so really, either bring a mitt or watch the game at home.